The article below is reprinted from blamepro.com. Some content was also provided by the City of Fullerton, CA. Several books document Mr. Fender's accomplishments. He belonged to what is often referred as "The Greatest Generation"; the era of Americans who fought in WWII and contributed ideas & inventions too numerous to mention, laying the groundwork for a period of unprecedented US growth and advancement in the world. Clarence Leo Fender came into the world on August 10, 1909, at the family ranch in California. His parents ran a succesful orange grove, located between the cities of Anaheim and Fullerton. Leo became interested in electronics around age 13, most likely from his uncle, who had built a radio from parts. Leo began dismantling and repairing radios himself as a hobby, never afraid to tinker with electronics to see what the result would be. In 1928, Leo enrolled in junior college as an accounting major. Leo was sharpening the business acumen that would serve him well throughout his career. Two events in the early 1930's would change Leo's life. One was when, in the early 1930's, he was approached by a bandleader to construct a PA system for use at dances. The second, around the same time, was when Leo met Esther Klosky. Esther became Mrs. Leo Fender in 1934. Trying the safe route first, Leo hired on with the State of California as an accountant. In 1938, he took a chance and opened the Fender Radio Service in downtown Fullerton. Soon, musicians began coming to Leo in search of improved guitars and amplifiers. 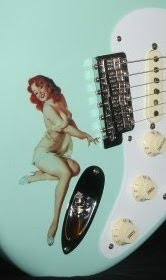 Fender began K & F Manufacturing with fellow inventor Doc Kauffman (who designed guitars for Rickenbacker) in a shed behind the radio shop where, in 1945, he unveiled his first electric guitar. In 1946, Leo opened the Fender Electric Instrument Company in Fullerton. It was there that he created the legendary Telecaster and Stratocaster — arguably, the most popular and successful guitar designs in history. Fender moved the small factory to 500 S. Raymond Ave. in Fullerton, and, in 1965, sold it to CBS Musical Instruments. Although, by his own admission, he "could not play a note," Fender went on to be inducted into both the Rock and Roll and Country Music halls of fame — recognition of the tremendous impact he had on contemporary society through his musical inventions. After the non-competition clause expired in the CBS sale agreement, Leo began designing guitars and basses for Music Man. The Sting Ray and Sabre are two Fender designs. In the 1980s, Leo opened the G&L business on Fender Avenue (named for him) in Fullerton. He continued to work there every day until his death on March 21, 1991, from complications from Parkinson's Disease.